Project 780: J. C. Lamsdell, P. A. Selden. 2013. Babes in the wood – a unique window into sea scorpion ontogeny. BMC Evolutionary Biology. 13 (98):1-46. Few studies on eurypterids have taken into account morphological changes that occur throughout postembryonic development. 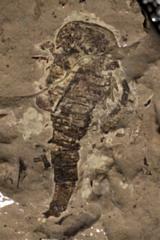 Here two species of eurypterid are described from the Pragian Beartooth Butte Formation of Cottonwood Canyon in Wyoming and included in a phylogenetic analysis. Both species comprise individuals from a number of instars, and this allows for changes that occur throughout their ontogeny to be documented, and how ontogenetically variable characters can influence phylogenetic analysis to be tested. (Kjellesvig-Waering and Størmer, 1952) and Strobilopterus proteus sp. nov. Phylogenetic analysis places them within the Pterygotidae and Strobilopteridae respectively, both families within the Eurypterina. Jaekelopterus howelli shows positive allometry of the cheliceral denticles throughout ontogeny, while a number of characteristics including prosomal appendage length, carapace shape, lateral eye position, and relative breadth all vary during the growth of Strobilopterus proteus. The ontogeny of Strobilopterus proteus shares much in common with that of modern xiphosurans,however certain characteristics including apparent true direct development suggest a closer affinity to arachnids. The ontogenetic development of the genital appendage also supports the hypothesis that the structure is homologous to the endopods of the trunk limbs of other arthropods. Including earlier instars in the phylogenetic analysis is shown to destabilise the retrieved topology. Therefore, coding juveniles as individual taxa in an analysis is shown to be actively detrimental and alternative ways of coding ontogenetic data into phylogenetic analyses should be explored.